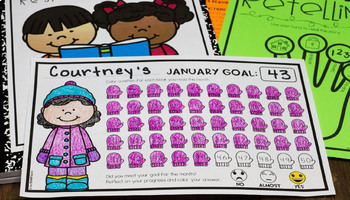 Develop an INTRINSIC DESIRE TO READ with these MONTHLY READING GOAL TRACKERS! 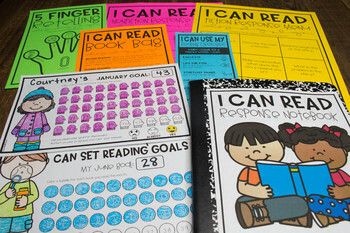 Includes 36 monthly trackers with GOAL LEVELS of 30, 50 and 100, so that you can easily DIFFERENTIATE for each child! 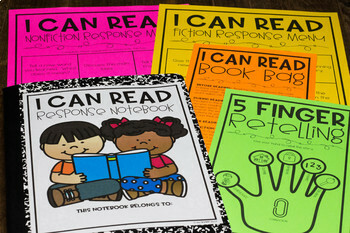 Plus, build reading FLUENCY, ACCURACY and COMPREHENSION skills with the included READING RESPONSE NOTEBOOK MENUS for FICTION and NONFICTION, reading prompt card for BEFORE, DURING and AFTER READING, 5 FINGER RETELLING mini poster, and reading ACCURACY BOOKMARKS! Perfect to use with STUDENT BOOK BAGS or BOXES in the CLASSROOM, but they also work exceptionally well with AT-HOME BOOK BAGS that the students can bring to and from school. We all know the best way to grow a reader is to READ, READ, READ! 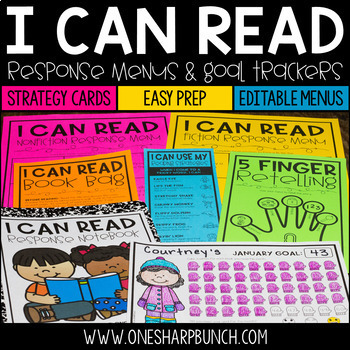 Monthly goal trackers, 5 Finger Retelling, reading strategies bookmarks, reading response menus and cover pages are BLACK and WHITE for EASY PREP. Thank you for visiting my store! If you purchase this product, please remember to leave feedback so you can earn your free TpT credits, which are redeemable on future purchases! Don't forget to follow my store for updates and fun FREEBIES! Stay connected! Visit my blog, Facebook page, and Instagram account!